The Philippine economy is performing very well and all economic indicators show that the positive performance will continue. The government is supporting big infrastructure projects which are bound to energize the performance of the trading industry. It is therefore no coincidence that HAMBURG TRADING CORPORATION has finished the construction of a modern warehouse and office in Sta. Rosa, Laguna. The 7,000 square meter complex is temperature and humidity controlled, which guarantees the quality and safety of the products that we deliver to our customers. We also have a demo kitchen which we will use to present and promote our principals’ products. And our goal is to be GWP and ISO 9001:2015 certified by June 2018. HAMBURG TRADING CORPORATION will continue to serve our customers with first class products and maintain the excellent commercial and technical services with which they are accustomed to. We will be guided to achieve this endeavor by the Hanseatic principles, which the city of Hamburg is known for. After five fruitful decades of serving the Philippine trading industry, we are ready and in a position to participate in the growth of the country for the years to come. Our roots can be traced back to 1968 when K.D Feddersen Ueberseegesellschaft mbH, a global trading company based in Hamburg, Germany, sent Horst Kessler von Sprengeisen to the Philippines to set up their Manila liaison office. With a suitcase in hand, his strong will and determination pushed him to venture into the Philippine trading business. Later in 1978, he founded HAMBURG TRADING CORPORATION. They rented an office space on the 9th floor of the Ramon Magsaysay Building along Roxas Boulevard, Manila. 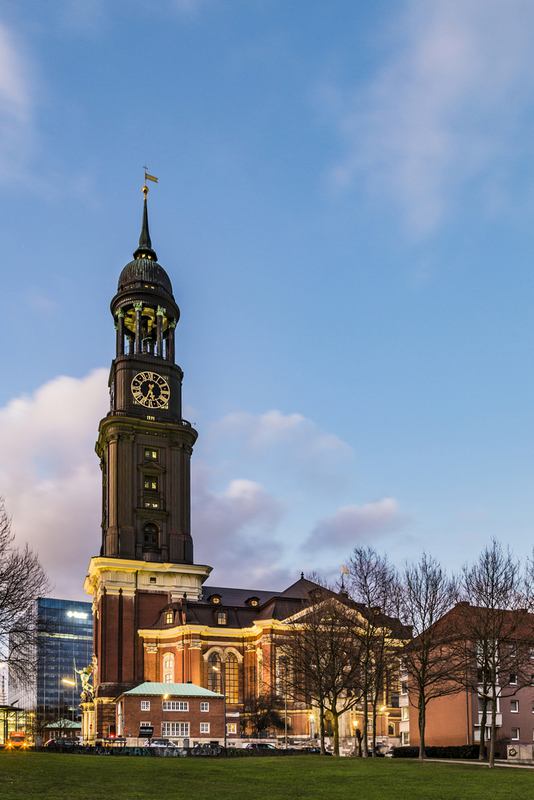 The St. Michael’s tower, one of the famous landmarks in Hamburg, became the company’s logo. HAMBURG TRADING CORPORATION focused on trading of industrial chemicals through indent sales. HAMBURG Trading acted as an agent or broker of foreign suppliers and manufacturers. Other subsidiaries were established during the early years of the company but were later discontinued. These are the Hamburg International Sales Corp. where they previously supplied sanitary wares, tiles, faucet and sinks from Europe, and the Hamburg Aromatics Phils. Inc., as agent and distributor of Haarmann and Reimer for flavours and fragrances. HAMBURG Trading also began to handle and trade in refractory materials catering mostly to the local cement, steel and glass industries, right after the EDSA Revolution in 1986. It was at this time when the new government allowed the importation of refractory materials, specifically magnesia-based products or basic refractory bricks, again. The importation of magnesia-based refractory materials started to flourish again, and so the company began working with Didier Werke A.G., the oldest and the biggest refractory manufacturer in the world as its exclusive agent in the Philippines. The Food Sales Department was established. HAMBURG Trading was appointed as the exclusive distributor of Cerestar, S.A, manufacturer of starch and starch derivatives based in France, Belgium and Germany. Cerestar had a wide range of products from native to modified starches, glucose, polyols, dextrose, and caramels. HAMBURG Trading, with the full support of Cerestar, introduced their modified starches to the Philippine market, on top of the Cerestar glucose syrup which had been a major product of HAMBURG Trading prior to the exclusive agency. K.D Feddersen acquired 30% of the company shares, and the Kessler family owned the remaining 70%. In the early 2000s, the Furniture department was established with Jowat, Pfliederer, Doellken (Surteco), and Bausch & Linnemann as its suppliers. Cerestar S.A was acquired by Cargill Inc.
HAMBURG Trading became the agent of Dimal Asia Pacific for refractory monolithic materials such as castables, mortars, plastics, etc. HAMBURG Trading also started representing Vesuvius for refractory brick requirements of its clients. Food packaging adhesives (Jowat) were introduced to serve the food and beverages industry. HAMBURG Trading started local distribution through a rented warehouse in San Pedro, Laguna. D.D Williamson appointed HAMBURG Trading as its exclusive distributor in the Philippines, after they acquired the Cerestar caramel business from Cargill in 2004. In June 2014, HAMBURG Trading acquired a 7,000-sqm lot in Meridian Industrial Park in Sta. Rosa, Laguna. HAMBURG Trading was appointed by Follmann as their supplier for wood to wood lamination (PVAC) and edgebanding (Hotmelt). HAMBURG Trading was appointed by Merck as distributor for Luzon food and beverage customers and for Zamboanga across all industries. In May 2016, the groundbreaking ceremony of the building was held at Meridian Industrial Park. HAMBURG Trading acquired a new supplier, Rayt Adhesives, for veneering and polyurethane base applications. The new HAMBURG Trading logo was created and launched in December. The Furniture department was renamed to ADHESIVES WOODWORKING COMPONENTS, which aims to be a one-stop shop for the furniture manufacturing sector. Surteco expanded the business by adding woodworking components to their portfolio, like the aqua pen, edgetrimmers, repair kit and portable edgeband machine. On January 02, 2018, the HAMBURG Trading family officially transferred to the new building at the Meridian Industrial Park. On April 26, 2018, the HAMBURG Trading warehouse and administration building was officially inaugurated. Monitor set quality objectives for continual improvement of our management system.